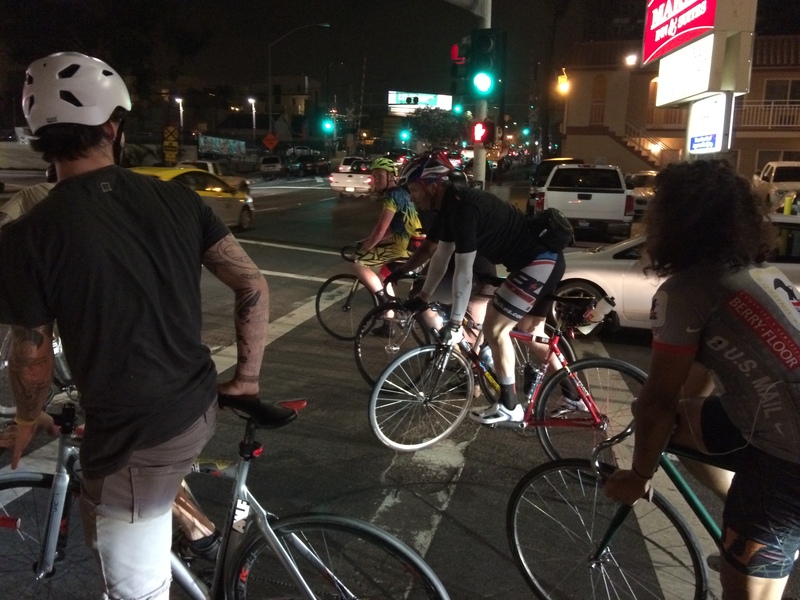 Just finished a fast fixie group ride with the AWLF/Cretins from downtown to Point Loma and back. We blazed out to Mission Bay, did a fast lap around Fiesta Island, and rode through the streets of Pacific Beach. We finished with a climb up Catalina in Point Loma, and pace-lined it back downtown. These guys are fast racers (the guy in the middle is doing a trackstand at the light), and it was all I could do grab a wheel and hang on. Once I tried to close the gap to the leading group, and got stuck in “no-man’s land”. Made me think, “that was a dumb idea”. Well, maybe next time I’ll be smarter, or stronger. George (on the right, w/o a helmet) crashed spectacularly right in front of me, at a pretty good speed, when we were racing up a hill in PB. He blew a tire, bent and cracked his rim. He changed his tube, and soldered on. Two flats and a crash. I made it back in one piece. Amazingly fun time. Nine months ago I could barely move and was miserable. Now, 20 kilos lighter and in pretty good shape, I roll with the hipsters in my ‘hood downtown.